RDKB, What Does that Mean? RDKB is short for Rack Drawer Key Board, it is a Rack Drawer that fits into a 19″ Rack and is only 1U or 1.75″ in height. It has an integrated keyboard Only or an integrated keyboard and KVM Switches built into it. We have several different Series based on budget, depth, and application. We have depths available to match our different PDD1, PDD2, and PDD3 Series. They are also used in conjunction with our DTS product line. The RDKB-I is our light industrial key board drawer with light industrial rails and key lock Front face. We offer them in two depths, the low cost I15 and our medium range I17 with full size mouse and keyboard. Our RDKB-T are built and designed around our transit case line of products. They utilize our custom made, military grade, slide rails. Our 6061 T6, aluminum stabilizing arms, our cable schlep cable management system, and thumbscrew front face options. We also have an extensive Offering of keyboards and KVM switches available for this series of products. These are not available on our lower cost units. 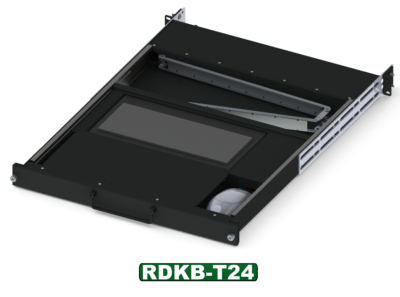 RDKB-T17: Transit Case Upgrade, 17″ Frame Depth, Extensive Keyboard Options, Fits Under PDD3-F18 Hydra Class Unit.